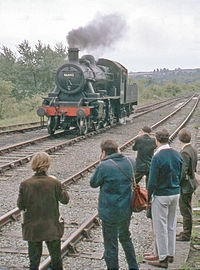 Significant events in the history of the Severn Valley Railway in preservation between 1970 and 1979 are set out below. The SVRSevern Valley Railway in preservation began operating between Bridgnorth and Hampton Loade in May 1970. 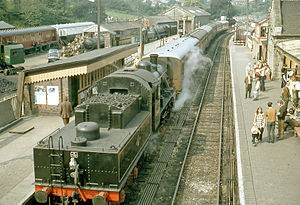 Passenger services between Bewdley, Kidderminster and Hartlebury were withdrawn by BRBritish Rail or British Railways with effect from 5 January 1970. The last service was the 19:20 DMUDiesel Multiple Unit from Bewdley to Kidderminster on Saturday 3 January 1970. This resulted in Bewdley Station becoming disused, along with the lines from Bewdley to Stourport and Foley Park. The original Severn Valley Railway remained open for coal traffic between Hartlebury and Stourport Power Station, while a section of “The Loop” remained open between Kidderminster Junction and the British Sugar Corporation factory at Foley Park. The ground floor sections of the former Pensnett signal box were brought from Pensnett to Hampton Loade for use in rebuilding the signal box there. The Civil Engineering Department welded more than a ton of steel plates onto the bridge girders of Hay Bridge to strengthen it. On 23 February the SVRSevern Valley Railway entered into an Agreement with Salop County Council that the Company would dedicate the necessary land to build Bridgnorth Bypass, which would sever the line south of Bridgnorth. The SVRSevern Valley Railway would then be responsible for construction of a bridge over the bypass. This agreement was necessary before the LROLight Railway Order could be granted to reopen the line. March 1970: A Ministry of Transport Railway Inspector visited the SVRSevern Valley Railway in March and made certain recommendations concerning safety aspects. 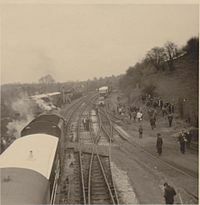 April 1970: The SVRSevern Valley Railway met with BRBritish Rail or British Railways on 7 April and agreed the final price for the purchase of the southern section of the line between Alveley Sidings and Foley Park. A letter of intent was sent to BRBritish Rail or British Railways the following day. Following the inspection visit in March, the second Light Railway Order was granted on 20 May 1970, allowing the SVRSevern Valley Railway to begin running public services between Bridgnorth and Hampton Loade. 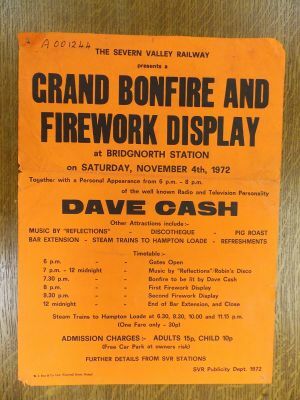 Whit weekend, Saturday 23 May 1970 saw the official opening of the Severn Valley Railway in preservation, with the first public trains running between Bridgnorth and Hampton Loade. Loco 3205 hauled the first service, the 14:00 from Bridgnorth. 46443, 43106, 48773 and Railcar 22 were also used over that weekend. The following weekend saw trains begin to run a regular weekend service. June 1970: 3 weeks after opening a potential problem emerged. Although the LROLight Railway Order gave the Guarantee Company a ‘license’ to operate, the line itself was still owned by BRBritish Rail or British Railways and therefore subject to the BRBritish Rail or British Railways steam ban. Services therefore ceased, but within 2 weeks SVRSevern Valley Railway members and well-wishers from around the world had boosted the ‘line fund’ to the extent that the balance of the £25,000 purchase price could be paid to BRBritish Rail or British Railways. Services then re-commenced, with the line now owned by the SVRSevern Valley Railway itself. July 1970: By 12 July the 10,000th passenger had already made the return journey to Hampton Loade, the final figure at December would be more than 63,000. LMS Stanier 5MT 45110 arrived on 20 August. GWR Churchward 4500 'Small Prairie' No 4566 arrived on 25 August. September 1970: Hollybush Road Footbridge was closed by Bridgnorth council on 30 September. The water tank from Henley in Arden was moved to its new location on the hill behind Bridgnorth station. Following the closure of Bewdley Station, the SVRSevern Valley Railway advised BRBritish Rail or British Railways that it was not interested in acquiring any of the line from Bewdley to Stourport, which was affected by a number of road schemes. However the SVRSevern Valley Railway would be interested in acquiring the line from Milepost 144½ at Alveley to Bewdley and Foley Park, in order to maintain their main line access. In October, BRBritish Rail or British Railways Estates Department advised the SVRSevern Valley Railway that Salop and Worcester County Councils, who legally had first refusal, did not wish to acquire the railway land, and that the cost to the SVRSevern Valley Railway would be £74,000. At an informal General Meeting at Kidderminster Town Hall on 23 October the SVRSevern Valley Railway members agreed in principle to proceed, although the cost was significantly more than the Society had previously raised to date. November 1970: BR(W) Hawksworth 1500 class 0-6-0PT No 1501 arrived on 7 November. The first full year of SVRSevern Valley Railway operation saw the arrival of Sir Gerald Nabarro. February 1971: On 16 February a total price of £74,000 was finally agreed, subject to contract, for the southern section of the line between Alveley Sidings and Foley Park the new boundary with BRBritish Rail or British Railways being at a point 200 yards east of Foley Park Halt. BR Standard 7MT No 70000 Britannia arrived on 9 April. B June, July and August, plus Bank Holiday weekends and as required. May be operated by diesel railcar. Sir Gerald Nabarro, the Conservative MP for South Worcestershire, advised the line to form a holdings company and to raise the cash for purchase of the southern portion of the line through a share offer. At the Guarantee Company AGM on 1 May 1971 Nabarro was elected to the Board of Directors, and the plans were announced to form the Public Company. This would have a capital of £150,000, of which £110,000 would be new money raised by the public share issue. The Guarantee Company would be wound up, with £40,000 of shares being vested in a Members’ Association, the Severn Valley Railway Association, in exchange for the assets it formerly held in the northern section. However in late 1971 it transpired that it was not possible to transfer the Light Railway Order from the Guarantee Company to another company, hence that company would need to remain in existence. The meeting was then adjourned until later in the year. BR Standard 4MT 2-6-4T No 80079 arrived from Barry Scrapyard on 15 May. June 1971: GWR Collett 5700 0-6-0PT No 5764 arrived on 19 June. July 1971: The Severn Valley Railway Association was formed at a meeting on 17 July. On 6 August the Guarantee Company AGM reconvened to discuss Nabarro’s plans for restructuring the railway, which had been circulated by letter with a recommendation by Chairman [[Andrew Marsden-Smedley]. After lengthy discussion the members agreed to these proposals. Ex-MOD Hunslet WD Austerity 0-6-0ST WD 193 arrived on 7 August. 45110 received the name ‘R.A.F. Biggin Hill’ in a ceremony at Bridgnorth on 12 September. Ex Longmoor Military Railway WD Austerity 2-10-0 No 600 Gordon arrived on 20 September on loan from The Transport Trust. October 1971: The Severn Valley Railway Association was formally constituted at a meeting on 16 October. Its principal objects were to safeguard the interests of the members of the Guarantee Company and to promote the efficient organisation, financial standing and growth of the Severn Valley Railway. During the year the new Holding Company SVR(H) was successfully floated, but the relationship between Sir Gerald Nabarro and the SVRSevern Valley Railway membership deteriorated. During a visit to the former Heaton Mersey diesel depot, Frank Cronin noted the shed which would eventually be acquired by the SVRSevern Valley Railway and incorporated into Bridgnorth Loco Works. The unconditional contract to purchase the southern section of the line was signed on 29 January. The season began on 4 March, with the timetable closely following that of 1971. Severn Valley Railway (Holdings) Limited ‘SVRSevern Valley Railway(H)’ was incorporated on 15 March, with Viscount Cobham as President and Sir Gerald Nabarro as Chairman. The role of SVRSevern Valley Railway(H) would be to finance the purchase of the Southern section of the line through the public share issue (for which Nabarro would be the figurehead), and to be responsible for overall policy decisions affecting the whole railway. The Guarantee Company would remain responsible for day to day management and operation of the Railway, including commercial activities, and also be responsible for the membership. Four days of Easter running began on 31 March, with 6,400 passengers making 13,000 journeys over the 4 days. April 1972: The public share offer for 58,000 shares in SVR(H) was launched on 12 April. May 1972: The share offer closed, having been over-subscribed by £24,000. On 10 June the excess proceeds of the share issue were returned, although the SVRSevern Valley Railway announced a rights issue of a further £50,000 at the same time. On 16 June BRBritish Rail or British Railways published the application for the LROLight Railway Order for the transfer of the line from Alveley to Foley, Park and Burlish via Bewdley. On 22 June the Department of the Environment announced the Bridgnorth Bypass had been transferred in to the firm Roads Programme for 1974. 0-4-0ST Invicta arrived at Bridgnorth on 30 June. July 1972: LMR 600 Gordon Gordon hauled its inaugural passenger train on 29 July. August 1972: Salop County Council formally asked the SVRSevern Valley Railway and other landowners to provide details of land owned by them which would be affected by the Bridgnorth bypass. LNER Gresley K4 West Highland 2-6-0 No 3442 The Great Marquess (BRBritish Rail or British Railways 61994) arrived on 9 September. The Rights Issue of £50,000 was fully subscribed by the extended closing date of 29 September. October 1972: On October 7 the Civil Engineering Department recovered a 2000 gallon water tank from Darlaston for future use at Bewdley. The following day the Department recovered two platform level water columns from Henley-in-Arden for use at Bridgnorth. November 1972: During the year, Nabarro began to assume greater power and control over the Railway (described some years later in an SVRSevern Valley Railway news article as ‘a committee of one’). By November 1972, members and volunteers were openly expressing the view that they were being alienated, and that proposed restructuring of the two Company Boards effectively meant that the membership would have no say in the running of the railway. Suspicions were also growing that the By-pass would be used as an excuse to abandon Bridgnorth and sell the site for housing development. On 3 November, the Guarantee Company Annual General Meeting was described as ‘noisy and controversial’ with some ‘pungent and straight talking’ resulting. The members unanimously passed three resolutions sponsored by the Severn Valley Railway Association (SVRA). These rejected proposed restructuring provisions which would give control of voting rights of the Guarantee Company’s 40,000 shares to SVRSevern Valley Railway(H) and would give SVRSevern Valley Railway(H) the power to appoint the Directors and Chairman of the Guarantee Company. Also the members voted that no final decision on the provision of a By-pass Bridge was to be made without a properly convened EGM, and that no paid appointments of railway staff should be made without applications for the post being invited from all members. At the AGM of the SVRA on 11 November, the members voted unanimously for the Association to continue. December 1972: Sir Gerald Nabarro announced on behalf of the Board that SVRSevern Valley Railway(H) was fully capitalised at £150,000, and that the Southern section of the line to Foley Park had been purchased from BRBritish Rail or British Railways subject to Light Railway Orders being granted. The share issue that he had fronted had thus been a success. The first stage of the Light Railway Order for the southern end of the line came into effect on 28 February. The British Railways Board (Severn Valley) Light Railway Order 1973 granted BRBritish Rail or British Railways the power (to be transferred to the SVRSevern Valley Railway) to operate as a Light Railway from the existing boundary at Alveley to a point 247 yards east of the Stourport Road Bridge. Power was also granted to operate over the Stourport Branch from Bewdley to a point 302 yards south of the southern portal of Mount Pleasant Tunnel, this section having been purchased by the SVRSevern Valley Railway for an additional £100. By early 1973, the SVRSevern Valley Railway was receiving considerable adverse publicity in the national press over some of the decisions made by the Board of SVR(H), in particular the dismissal of the Railway’s Operating Superintendent and Shedmaster from his salaried post. This decision had caused uproar amongst the volunteers and raised the very real possibility of a strike. Following an Extraordinary General Meeting of the Guarantee Company on 11 March and a special Joint Meeting of the boards of SVRSevern Valley Railway(H) and the Guarantee Company 6 days later, an announcement was made that Sir Gerald Nabarro would step down as Chairman of both Boards. He was replaced as SVRSevern Valley Railway(H) Chairman by Viscount Garnock. It was also agreed that nominated directors of both the Guarantee Company and the SVRA would sit on the SVRSevern Valley Railway(H) Board. 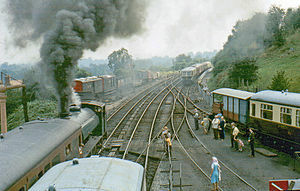 By June 1973 the atmosphere on the railway had noticeably improved. An EGM of the Guarantee Company overwhelmingly voted in favour of raising money to build the By-Pass Bridge, thus ‘saving Bridgnorth for a second time’. Locomotives arriving during 1973 were; 4141, 5164, 7819 Hinton Manor and 4930 Hagley Hall which all arrived on 6 January, 78019 which arrived from Barry Scrapyard on 12 March, 7714 which arrived on 29 March, 75069 which arrived on 31 March, and Stanier Mogul 42968 which arrived on 14 December. In November 1973, 5764 was involved in the filming of the BBC children's serial Carrie's War. Having left the SVRSevern Valley Railway, Sir Gerald Nabarro died on 18 November 1973. He had suffered two stokes during 1972 and had recently retired from the House of Commons due to ill health. In December 1973, WD 193 operated all the Santa services. The Great Marquess was steamed for the first time since arrival the previous year. With an axle weight in excess of 19 tons, it exceeded the limit of 17 tons 12 cwt in the SVRSevern Valley Railway's Light Railway Order granted in May 1970. A condition of the locomotive's move to the SVRSevern Valley Railway was that it could be used there once restored, so the locomotive was therefore stored while discussions took place over a possible transfer to another railway. In the meantime a program of work was underway to upgrade the line, including replacement of several bridges, to raise the permitted limit to a figure in excess of 20 tons. This upgrade was achieved in due course. In 1974 the SVRSevern Valley Railway began services to Bewdley and increased the amount of daily running during summer, resulting in a near tripling of the miles covered. March 1974: The Light Railway Transfer Order was granted to extend the line from Hampton Loade to Bewdley. April 1974: Easter weekend saw services begin between Hampton Loade and Highley. The first passenger service was the 09:30 from Bridgnorth with GWR Railcar 22, followed by the 12:45 steam service hauled by No 600 Gordon. The weekend saw 16,000 passenger journeys. 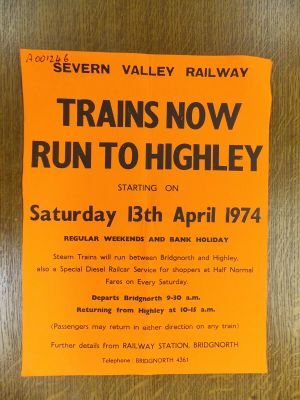 May 1974: The line was further opened from Highley to Arley and Bewdley. GWRGreat Western Railway Railcar 22 operated the first round trip between Bridgnorth and Bewdley, while the first steam services were hauled by No 5764 from the new MPD at Bewdley and No 43106 from Bridgnorth. Daily running during the summer season was extended to five weeks. July 1974: 46521 became the SVRSevern Valley Railway's first Barry restoration to enter service. August 1974: 2047 Warwickshire made a guest appearance in steam at the Town & County Show at Stoneleigh. Remarkably, the locomotive covered 8½ miles on a temporary track only 40 ft long! The 1975 timetable included 118 running days between March and October, with 554 trains in each direction. Spring 1975: Announcements were made that Invicta had been sold and was be leaving the SVRSevern Valley Railway. Also 4110 would not be coming to the SVRSevern Valley Railway as planned, but would instead go to the WSR. However Railcar 22 would remain on loan from the Great Western Society for another 5 years. 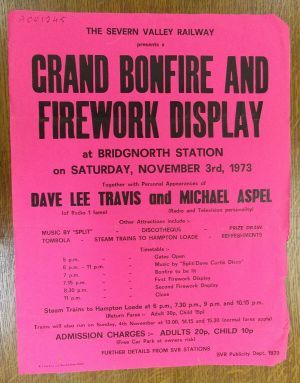 May 1975: Arley Loop was opened on 25 May, allowing a Spring Bank Holiday 45 minute service from Bridgnorth to Bewdley with 4 train sets, instead of the existing 90 minute service. 46521 and 43106 were the first trains to pass at Arley. June 1975: The SVRSevern Valley Railway membership topped 5,000. 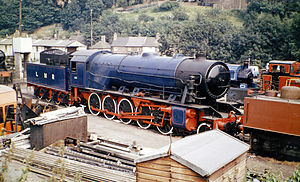 July 1975: German 2-6-2T DB 64.305 arrived on 17 July. Four SVRSevern Valley Railway engines and three carriages attended the Rail 150 celebrations at Shildon, celebrating the 150th anniversary of the Stockton and Darlington Railway. 600 Gordon travelled light engine to Shildon, later followed by a three coach train comprising 8233 (pilot), 43106, Clapham Buffet 9631, LMS 26986 and LNERLondon & North Eastern Railway Passenger Brake 4236. 813, which has been cosmetically restored for the event, went by road. 2857 and 9303 arrived from Barry Scrapyard on 13 August. ¾ of a mile of the old Stourport branch was relaid. The section was used in the filming of Universal Pictures' The Seven-Per-Cent Solution. A number of the SVRSevern Valley Railway's locos took part in the film. The SVRSevern Valley Railway’s first Enthusiasts Day (the forerunner of the autumn Steam Gala) saw 11 locomotives in steam, with 10 hauling passenger services and DB 64.305 shunting. Two of the locos were Austrian Railways 2-6-0 locomotives in Furness Railway red livery with flared stovepipe chimneys and huge brass domes - 46443 and 46521 were ready for their starring roles! One of the locomotives appeared in this short film featuring Chris Tarrant, available on BFIplayer. December 1975: Christmas services were between Bewdley and Arley, due to engineering work on the north of the line. The 1976 timetable included 118 running days between March 6th and October 31st, now with 735 trains in each direction. As they year opened, negotiations with BRBritish Rail or British Railways were in progress over the proposed Kidderminster Terminus. The SVRSevern Valley Railway was also negotiating with BRBritish Rail or British Railways for the SVRSevern Valley Railway to become an approved steam depot for main line running. March 1976: Construction of the loco shed at the Bridgnorth MPD began. This would take around a year to complete using parts of the former Portskewett and Heaton Mersey Sheds acquired for that purpose. April 1976: 7812 Erlestoke Manor arrived on 23 April, having previously been at the Dowty R.P.S. site at Ashchurch. May 1976: A busy day on 3 May at Bewdley MPD saw the lifting of 5 boilers and 2 frames in a single day. The boilers belonged to 5164, 4930, 7819, 7812 and 7714; the first and last also involved moves of the frames.August 1976: The 'long hot summer' of 1976 caused problems as SVRSevern Valley Railway volunteers fought dozens of fires along the railway. A spare HawksworthFrederick Hawksworth, Chief Mechanical Engineer (CME) of the Great Western Railway 1941-1948 4000 gallon tender was filled and taken to Spring Grove (near Rifle Range Halt) to help the county fire brigade, assisted by SVRSevern Valley Railway volunteers, fight a nearby forest fire which took 2 days to extinguish. September 1976: The first Autumn Enthusiasts Weekend (as opposed to day) saw the first "top-and-tailed" steam services to Foley Park. 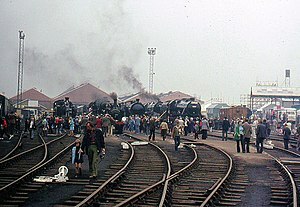 7 Locomotives were in steam (813 having failed on the first day). The pits were being dug for the new Bridgnorth loco shed. The first outgoing railtour took place. A photo in SVRSevern Valley Railway news Edition 43 later showed Paddington Arrivals Information board on 13 November 1976 displaying the arrival of a service originating from Bridgnorth. This used the SVRSevern Valley Railway's Great Western rolling stock and was hauled by Brush Type 4The British Railways classification for diesel locomotives of 2000 bhp to 2999 bhp diesel locomotive No. 47 120. For the first time, the SVRSevern Valley Railway ran limited services in January and February, on Sundays between Bewdley and Arley. Over the winter, intense cold followed by heavy rain resulted in the line at Sterns dropping 2ft 6" and moving 4ft nearer the river. Work on Borle Viaduct was suspended while this was resolved, and through services over the viaduct were 3 weeks late starting as a result. A large part of the front car park at Bridgnorth had also collapsed. Better news came with the arrival of 6960 Raveningham Hall. The frames of the new Bridgnorth loco shed were erected. Viscount Cobham died. A staunch supporter of the SVRSevern Valley Railway, he was the first President of the SVRSevern Valley Railway during the public floatation of the Holdings Company in 1972. Bridgnorth Loco shed was completed. 11 SVRSevern Valley Railway coaches were used on a main line trip to Chester. 48773 hauled the service from Bridgnorth to Bewdley, other motive power during the day included the locomotives King George V and Princess Elizabeth. September saw the grand opening of the cast iron gentlemen’s toilet on Bewdley’s island platform, following its relocation from Melrose in Scotland. The ceremony was carried out by the Mayor of Bewdley, who congratulated the Railway on opening the town's first public urinal on that side of the river. Enthusiasts Day saw 10 SVRSevern Valley Railway locos in steam including 7819 Hinton Manor and 6960 Raveningham Hall. Date not recorded: 45000 arrived on loan from the NRMNational Railway Museum. In 1978 SVR based locos were beginning to provide locomotives to work on main line rail tours while stabled at depots such as Hereford. Visitor numbers to the SVRSevern Valley Railway increase; for the first time the railway sold more than 150,000 tickets in a year. January 1978: 4150 arrived on 19 January, having previously been at the Dean Forest Railway. The Rolling Stock Committee decided that 4150 should be the last Barry Scrapyard engine to come in, as there were now 33 locomotives stationed at the railway. A naming ceremony was held for WD 193, which was given the name ‘Shropshire’. Raveningham Hall became the first SVRSevern Valley Railway-based locomotive to haul a main line tour. Leaving the SVRSevern Valley Railway on 7 April, it worked the F&W Railtours “Cathedrals Express” from Hereford to Chester and back the following day. May 1978: 70000 Britannia returned to steam after 12 years, and was renamed on 20 May by Mr R A RiddlesRobert Arthur "Robin" Riddles, Member of the Railway Executive for Mechanical and Electrical Engineering responsible for the design of the British Rail Standard Class locomotives, the locomotive’s designer. Date not recorded: Pannier 3612 was purchased from Barry Scrapyard for spares. During 1979 7802 Bradley Manor arrived from BarryWoodham Brothers Scrapyard, Barry, South Wales. The source of many locomotives now in preservation., assuming the title of 'last BarryWoodham Brothers Scrapyard, Barry, South Wales. The source of many locomotives now in preservation. engine to come in'. March 1979: Major work was again required to stabilise the line at Sterns. 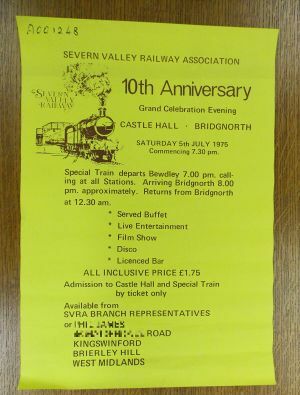 May 1979: BRBritish Rail or British Railways agreed to allow through excursions onto the SVRSevern Valley Railway. The first such excursion, oganised by the Monmouthshire Railway Society, arrived at Bewdley from Cardiff. June 1979: 2857 was steamed for the first time since restoration; the first ChurchwardGeorge Jackson Churchward, Chief Mechanical Engineer (CME) of the Great Western Railway 1902-1922 2-8-0 to do so. July 1979: The Didcot Great Western Society's veteran Wantage Tramway locomotive "Shannon" was used for filming scenes of the BBC children's drama television series God's Wonderful Railway on the SVRSevern Valley Railway, but was not steamed while here. LNWR 3020 Cornwall arrived on 16 August. The locomotive was being lent to the SVRSevern Valley Railway by the NRMNational Railway Museum for a 5 year period including restoration. As an experiment, BRBritish Rail or British Railways ran a weekend DMUDiesel Multiple Unit service from Kidderminster to Bewdley. September 1979: 7812 was officially re-named "Erlestoke Manor" in a ceremony on 1 September. December 1979: Christmas running took place between Bridgnorth and Hampton Loade. Information is from past editions of Severn Valley Railway News and from sources listed under 1965-1969. ↑ SVRSevern Valley Railway News 58 Winter 1980/81, p.34., "Steam Locomotive Mileages for the Decade"